Decadenz choco-fudge should be at the top of your happy snacking list, with their yummy (and did we mention guilt-free?) choco-fudge jars. We have tried all sorts of chocolate things – be it a typical bar or a gourmet dessert, but the sinfully gooey dark chocolate goodness jars are making chocolate exciting again. We tried the array of Decadenz jars on offer, and are addicted to their guilt-free sinfulness! It’ll become your go-to-dessert for its rich, dark chocolate content, smooth, gooey texture and the varied flavours with a burst of good ingredients. Whether you need a chocolate-y buddy for a movie marathon or a bad day, Decadenz will be your savior. If you need to pack some lunch for your younger sibling or your child, slip in this adorable jar and you are good to go. What a happy, yummy snack! Order online via Zomato, Foodpanda and UberEats for the G-town folks – that’s the quickest way to get your hands on these Decadent delights. If you’re not in G-town, you can order Decadenz products from anywhere in India, via any of these E-commerce portals- Amazon, Snapdeal, Paytm Mall, Shopclues, Qtrove, etc. To know more, follow them on Facebook & Instagram. 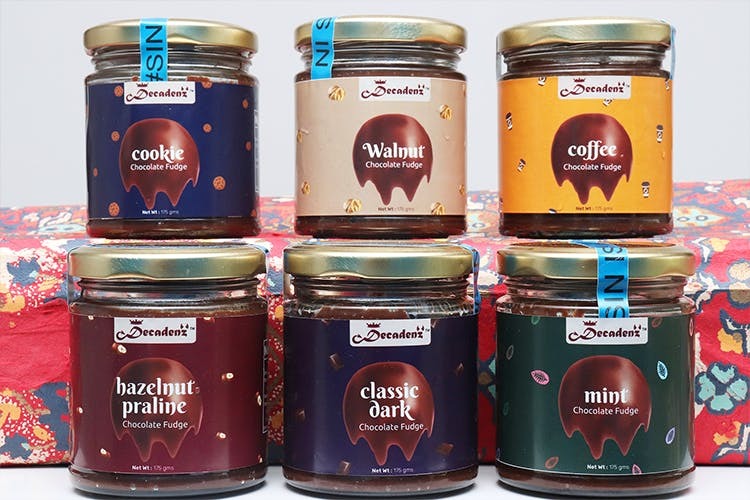 Decadenz Chocolate Fudge Jars Are The Best Gift Ever!